YOU BLEW IT! NOW WHAT? 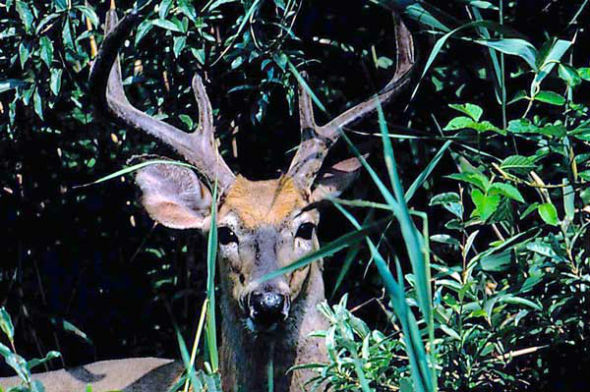 A big Long Island buck with its suspicions raised carefully considers its next step. The action begins at 7:00 a.m. as three does emerge from the laurels without giving you a glance. As you draw on the six-point bringing up the rear, a creak in your tree stand echoes through the woods and with loud snorts and white flags waving high the quartet bounds over the nearest ridge. Two hours later you’re still anguishing on stand. “I blew it,” you murmur, feeling hopeless. But then, just as your confidence level sinks below the rim of the nearest mushroom, the soft crack of a limb draws your attention back to where the deer had first emerged. Half submerged in the tangles stands a monster buck! He’s 35 yards away and closing on your shooting lane. Your heart pounds out an electrifying rhythm as you raise your bow and wonder, Can I be this lucky? Of course, the answer is no. The big buck takes two steps out from under the bushy leaves and picks up the scent of fleeing deer. Immediately he turns to follow the escape route of the earlier quartet and slinks out of sight. Half an hour later your hands still shake. It happens. No matter how good a hunter you become, you’re still going to spook deer now and then. For most hunters, the game is over at this point. But it doesn’t have to be – at least not always. You’ve been picked out by a wary doe. Your next move can make or break your hunt. Take the example above. Had the hunter immediately made a move to reposition along the escape route used by the early morning herd, he might have gotten a crack at the big buck that came through later. For sure, blowing his cover cost him a great opportunity with the first buck, but it also pinpointed exactly where the 12-point was likely to head. Considering that the spooked deer certainly left a strong blast of fear pheromones behind as they bolted, was there any doubt that second buck would follow suit? If you find yourself in a similar situation, consider making a move to cut your losses. Grab your bow, circle wide of the escape route – without crossing it at any point – and get in position 30 or 40 yards away with the wind in your favor. Watch closely for where spooked deer break stride to look back as they scurry away. Then get in position to target that point; following deer will likely break stride in the same spot. Making a loud noise on stand is a surefire way to send whitetails bolting for cover, but sometimes more subtle tip-offs draw a deer’s attention without provoking immediate retreat. Take, for instance, a buck that catches you checking the time from a great distance. 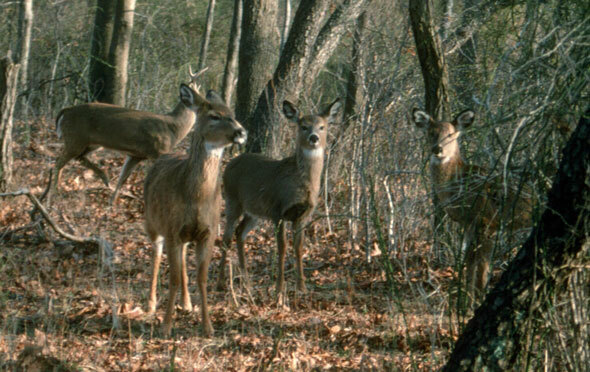 If the wind is in your favor and the deer can’t make out a distinct human shape, odds are you’ll have a cautious but curious animal on your hands. Don’t give up on it. Usually, it takes at two stimuli to send a whitetail into panicked flight. The first sound, scent or motion causes it to focus attention; the second confirms its suspicions. There are many sounds, sights and smells in the deer woods and if every deer ran at the first faint hint of trouble, none of them would ever stay put for more than a few seconds. Leaves rustle, branches rub together, squirrels drop nuts. With all this noise and movement happening, it’s possible a whitetail will dismiss a subtle mistake. Sometimes, a deer picks out a hunter from a distance and simply changes direction to skirt his position, staying within sight but slightly out of range. Can you bring this deer back? You bet! This is one place where grunting and rattling really shine. The key in this instance is to call lightly, only once or twice, or to touch your rattling sticks together just enough to activate a whitetail’s curiosity mechanism. Make your move while the deer is looking away and, if it turns toward your call, quit while ahead. It may take some time but often a deer will circle back for a closer look. Grunting and rattling are also useful tools for covering small noises made by accident, say, dropping a fanny pack or water bottle from your tree stand. Wait about 30 seconds after making a noise, then offer a light grunt or rattle. If you get lucky, an unseen buck will connect the two sounds as being from another deer and come closer for a look. Even if a whitetail knows you’re a human fast thinking can sometimes save the day. 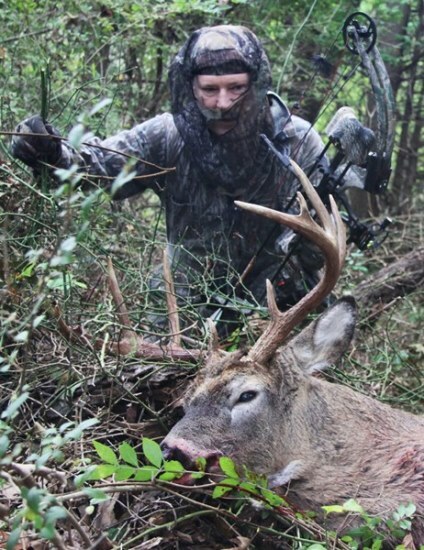 I know one hunter who arrowed a trophy buck after leaving no doubt its privacy had been violated. The author arrowed this East End brute after it heard him move on stand but couldn’t confirm his presence with scent or sight. Photo by Felicia Scocozza. Trekking into his stand he startled a 12-pointer from its early morning bed. The buck jumped up and headed full speed for the far end of a thick briar patch 40 yards away. As the deer crashed through the woods, the hunter bee-lined for a slight opening near the center of the tangle. He figured that the deer running through the brush couldn’t hear him running at the same time. Dropping to one knee and knocking an arrow, the archer put his sight on the center of the hole and hoped the monster would turn upwind. Within seconds the Pope and Young crept through the opening and a 22-yard shot put it to rest! It all goes to show, if you think fast and stay calm, there is always a chance to turn a “blown” hunt” into the thrill of a lifetime.